CANTON, MA (October 28, 2015) - Colder weather is coming soon, and Dunkin’ Donuts is now offering guests a cool new hot chocolate choice by adding a bit of chill to this winter favorite. Dunkin' Donuts is giving hot chocolate fans the chance to run hot or cold, now serving any of the brand’s famous hot chocolates either hot or in a new frozen version at select Dunkin’ Donuts restaurants nationwide. 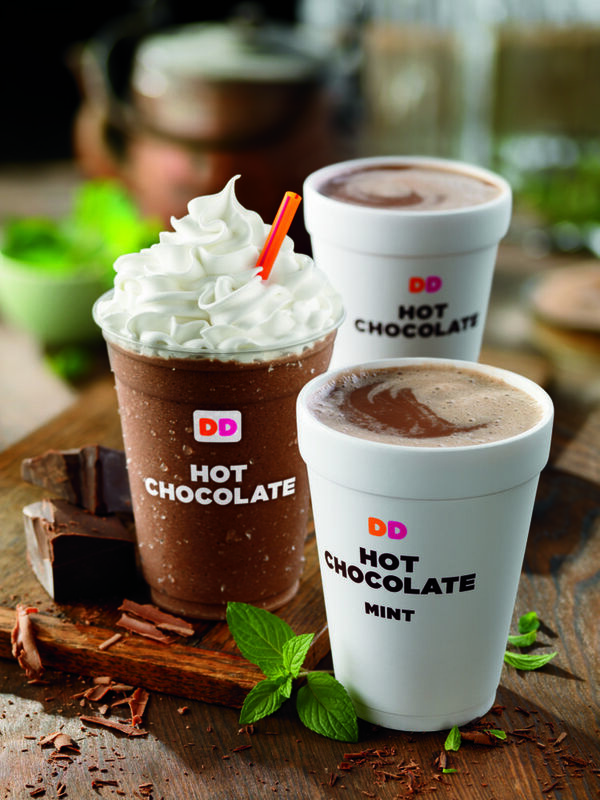 These include favorite Hot Chocolate flavors such as Original, Mint and Frozen Dunkaccino®, an indulgent beverage with a unique blend of mocha and coffee flavors which was introduced earlier this year. Dunkin’ Donuts’ coolest new way to enjoy hot chocolate happiness joins the brand’s full lineup of blended frozen beverages, launched this year following the installation of new blenders at Dunkin’ Donuts restaurants throughout the U.S. Dunkin’ Donuts’ blended frozen beverages menu includes two varieties of freshly prepared Fruit Smoothies, Strawberry Banana and Tropical Mango, both made with real fruit and creamy low-fat yogurt. Dunkin’ Donuts is also serving Coolatta® Lite, a lighter version of the Dunkin’ Donuts’ popular frozen Coolatta® beverages. Dunkin’ Donuts also offers Hot Cocoa K-Cup® pods* to enjoy a cup of Dunkin’ Donuts’ classic hot chocolate in the comfort of home. Sold exclusively at participating Dunkin’ Donuts restaurants, Dunkin' Donuts Hot Cocoa K-Cup® pods are for use with the Keurig® Single-Cup Brewing system.